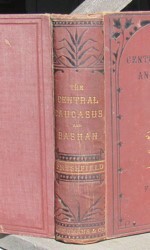 This is the first printing of the first edition of Travels In The Central Caucasus And Bashan, Including Visits To Ararat And Tabreez, And Ascents Of Kazbek And Elbruz by Douglas Freshfield. This book was published in London by Longmans, Green & Co in 1869. The book measures 216mm tall x 155mm and has 509 pages, color frontispiece painting, 16 in-text woodcuts, 3 full-page woodcuts, 3 color folding maps, 2 panorama sketches, 3 appendices, 2 pages advertisements at end. 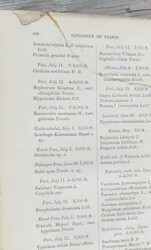 Account of the first ascent of Kazbek (5047m) & first ascent of the East Peak of Elbruz (5595m) in 1868, attempt on Ararat, & general description of the peaks & glaciers of the Central Caucasus. Author’s partners on these climbs were Tucker, Moore, & Dévouasoud. CONDITION: Original brown cloth, embossed gilt decoration cover, gilt lettering spine, black lettering cover, black border decorations cover & spine, original brown coated EPs. The book has some rubbing at corner tips, some thin light scuff marks spine, a couple of small light spots on covers, cracked paper at front inside hinge (holding strong, not broken), rear hinge paper is not cracked, old owner name and date 1869 penned to top of title page, no other writing or owner marks on any pages, loss to upper edge of 2nd folding map (now restored at loss area only with copy from a complete map -- completely reversible since it is held in place only with post-it strips -- see photo), tear across one page in the index (repaired long ago with dabs of wheat paste -- see photo), three leaves starting at page 69 have 4cm tear inside lower margin that most likely occurred at time of binding (see photo). Price: $525.